Review: Japanese Legends all in a comic book?! 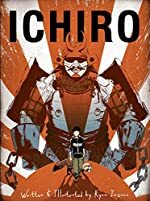 Ichiro is a young boy from Brooklyn, New York who goes on the adventure of a lifetime in Ichiro, a graphic novel by Ryan Inzana. Ichiro is a good book. To find out more read on! Ichiro begins is on a plane with Ichiro on route to visit his grandfather in Japan. But before he reaches Japan, the author shares a legend about a raccoon that can morph into anything. Once Ichiro reaches Japan, he heads to his grandfather's house where he sees a raccoon for a split second before it disappears. Remembering the legend, the next night, Ichiro camps out to find the raccoon but eventually gets tired and falls asleep. When he awakens, he is in the underworld surrounded by guards ready to kill him. Will Ichiro live? How did he get into the underworld? Who's the raccoon? Read Ichiro to find out the answers to all of the questions above, AND MORE! Ichiro is a good book. It has a lot of dialogue at the beginning and very little at the end so it is very important to pay attention to the graphics at the end. Ichiro contains information that is appropriate for middle school readers as well some information that would lend itself more to adult readers. Readers would have to keep this in mind when selecting Ichiro. It is geared, however to readers age 12 and up. The character, Ichiro, is easy for readers to relate to because of the lesson he learns in the story. I rate this book 3 out of 5 stars. Some pages are just all pictures and no words which left me uncertain as to what was going on at some parts. Possibly an avid graphic novel reader would be better at interpreting the illustrations, but it was a struggle for me. Overall, however, Ichiro is a good book. It is a relativity quick read because there are far more pictures than words. Ichiro is a good book for a trip to pass the time. We would like to thank Houghton Mifflin Harcourt for providing a copy of Ichiro for this review. Have you read Ichiro? How would you rate it?